On hand as a presenter, La La stepped out last night(December 4th) for the 2018 FN Achievement Awards at the IAC Headquarters in New York City. Seeing as she was presenting to Kerby Jean-Raymond, naturally she wore a look from the designer's PYER MOSS collection. 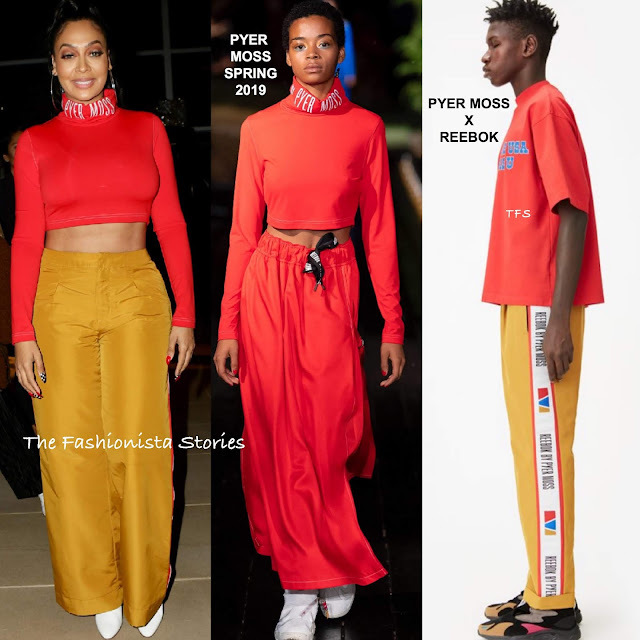 Her ensemble featured a red long sleeve SPRING 2019 logo crop turtleneck top and the PEYER MOSS x REEBOK yellow logo printed side seam pants. While the pants are a little on the tight side, this is a cute look and I like the color combo. However I don't think she needed those over-sized hoops but that's another minor issue. She finished up with a high ponytail and white boots. Are you feeling La La's sporty look?